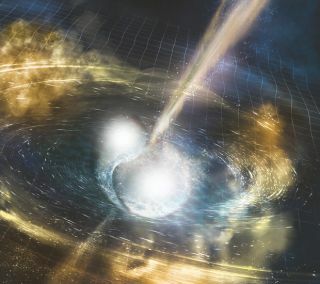 An artist's illustration of neutron stars colliding and merging together. It was a big year for space science, which means it was a tough job picking our favorites Here they are: are Space.com's top 10 favorite science stories of 2017. 2017 may go down in history as the year when a new era of "multi-messenger" astronomy truly got off the ground, thanks to one incredible discovery. The past 12 months have also been full of awesome discoveries about alien planets orbiting distant stars, including the detection of seven Earth-size planets around a single sun. And while scientists had to say farewell to the Cassini spacecraft, they also said hello to what might be an interstellar visitor to our solar system. Be sure to tell us your favorite science stories in the comments! August 17 was a big day for astronomy; the kind of day that will be featured in history books and talked about as the beginning of a new era. On that day, astronomers made the first-ever observation of a cosmic event using both light and gravitational waves. This is called multi-messenger astronomy, and it's been compared to a person gaining a new sense of perception. Researchers have long been able to see the universe with light, now they can "hear" the universe with gravitational waves. When combined, the power of these two methods is greater than the sum of its parts. In fact, the journal Science named the discovery its 2017 Breakthrough of the Year. This artist's illustration shows TRAPPIST-1, an ultracool dwarf star with seven small planets orbiting very close to it. In early January, scientists announced the discovery of not one, not two, not six…but seven Earth-size plants orbiting the star TRAPPIST-1. NASA was quick to provide some imaginative imagery of what the planets might look like, and envisioned what it would be like to stand on the surface of those planets. There was even discussion about how life, if it arose on just one of the planets, might have been carried to some of the other worlds via asteroids. An illustration of the moon moving across the sun, in a total solar eclipse. On Aug. 21, for the first time in nearly 100 years, a total solar eclipse crossed the U.S. from coast to coast. Along a narrow path stretching from Oregon to South Carolina, people watched as the moon blocked out the disk of sun, transforming night into day and revealing hidden layers of the sun's atmosphere, for just a few brief moments. Cities both large and small welcomed the onslaught of visitors who drove into the path of totality (the area from which the total eclipse was visible), which was only about 70 miles wide. People scrambled to find eclipse glasses (and some shady dealers took advantage of that), and prayed for clear skies. And many, many people watched the event online from outside the path. Saturn's moon Enceladus, photographed here by the Cassini spacecraft, has a subsurface ocean that also contains a chemical energy source that could be used by life-forms. In April, NASA scientists announced the detection of a possible energy source for life in the liquid- water ocean on Saturn's icy moon Enceladus. Samples from the subsurface ocean were obtained by the Cassini spacecraft, which made multiple passes through plumes of water that erupt from Enceladus' icy crust. Once thought to be a solid chuck of ice orbiting the ringed planet, Enceladus is now considered one of the most potentially habitable environments in the solar system (besides Earth). Under the moon's solid, icy surface lies a global, liquid water ocean, and on the floor of that subterranean sea, hot water vents could support ecosystems like those found at the bottom of the ocean on Earth. An artist's illustration of the Cassini spacecraft plummeting through Saturn's atmosphere. The Cassini spacecraft is one of NASA's great success stories. During its 13-year tenure at Saturn, the probe provided an up-close view of the planet's swooping rings, its turbulent cloud tops and many of its invisible features, like its magnetic field. Cassini also revealed a surprising amount of complexity in Saturn's moons. The probe found oceans of liquid methane, plumes of water erupting from an ice ball, and strange red streaks. An artist's illustration of gravitational waves, or ripples in the space-time fabric, created by two merging black holes. It's been two years since scientists made the first-ever direct detection of gravitational waves — ripples in the cosmic fabric first predicted by Albert Einstein — and the field is absolutely booming. The Laser Interferometer Gravitation Wave Observatory, which made that initial discovery in 2015, announced the detection of gravitational waves from a neutron-star merger, which were also detected by more than 70 light-based telescopes and observatories. This was such a significant moment for astronomy, that we've chosen it as the No. 2 story on our list. Perhaps the biggest indicator of this field's significance was the announcement that three scientists who pioneered the design and construction of LIGO were awarded the Nobel Prize in physics. LIGO also found three more black-hole mergers, which makes five confirmed black-hole mergers spotted by LIGO. The details of those detections are interesting in their own right, but scientists are mostly excited that they are well on the way to having a large population of black-hole binaries to study. With a large population of black holes, scientists can begin to understand what characteristics are shared by these objects, and which characteristics are unique. From there, they can begin to understand how these objects form, and how they fit into the larger story of the universe. Wait, there's more! The Virgo gravitational-wave detector came online in Italy in August, and made its first detection almost right away, spotting one of the black-hole mergers that was also seen by LIGO. By working together, LIGO and Virgo will be able to better confirm the detection of gravitational-wave signals, and do a slightly better job of narrowing down where they came from. It's been a big year for gravitational waves, and the future is bright for this budding field. The projected path of a space rock that might be the first interstellar object ever spotted in Earth's solar system. Researchers may have made the first-ever detection of an object in Earth's solar system that originated somewhere outside the system. The space rock, named 'Oumuamua, was first detected in October by scientists using the Pan-STARRS 1 telescope in Hawaii. The dwarf planet Ceres is the largest object in the asteroid belt between Mars and Jupiter. It contains water and organic molecules. Ceres is the largest object in the asteroid belt between Mars and Jupiter, and is dually categorized as both a dwarf planet and an asteroid. At first glance, its cratered and barren surface certainly doesn't look like a place where life would form. But the more scientists learn about Ceres, the more habitable it looks. This artist's illustration shows the near-Earth-size planet GJ 1132b, located 39 light-years away. Researchers have detected an atmosphere on GJ 1132b, a first for an exoplanet of this size. For the first time, researchers have observed the atmosphere of distant planet that is just slightly larger than the Earth. The planet, called GJ 1132b, appears to have a very hot and very thick atmosphere, which confirms earlier suspicions that this world has more in common with Venus than with Earth. The direct observation of this planet's atmosphere is significant because thus far, astronomers have been able to directly study atmospheres only around gas giant planets like Jupiter. In at least one case, researchers directly observed the atmosphere of a planet eight times the mass of Earth. GJ 1132b, on the other hand, has a radius about 1.4 times that of Earth, and a mass 1.6 times that of Earth. This image of an inner slope of a crater on southern Mars has several seasonal dark streaks called "recurrent slope lineae," or RSL. In 2015, researchers announced that they'd found evidence of liquid water on the surface of Mars. NASA later supported the claim that dark streaks on Martian hillsides (called recurring slope lineae, or RSL's) could be caused by liquid water mixed with high levels of salt. The salt would prevent the water from freezing or instantly turning into a gas in the thin Martian atmosphere. There were quite a few amazing space stories this year that didn't quite make our top 10 list. Here are some of the runners up. New observations showed that Jupiter's auroras are even more mysterious and complex than researchers previously thought. They appear to be totally unlike Earth's auroras, as evidence by the fact that the north and south pole auroras are asymmetric. A new measurement of the age of the moon found that Earth's neighbor is slightly older than some previous estimates suggested. The speed of the universe's expansion is a major mystery in astrophysics at the moment, with two seemingly reliable measurement approaches producing slightly different results. A new study solidified one of those measurements, which means the mismatch likely lies in scientists' fundamental understanding of universal expansion. The hottest exoplanet ever discovered is a real scorcher — in fact, it's hotter than the surface of some stars. KELT-9b's is a blazing 7,800 degrees Fahrenheit (4,300 degrees Celsius), or just 2,200 degrees F (1,200 degrees C) cooler than the surface of the sun. For the first time in 37 years, scientists turned on the backup thrusters on the Voyager 1 probe. The test firing gave the mission managers assurance that if the probe's primary thrusters fail, the spacecraft will still be able to point itself toward Earth and send back data from the edge of the solar system. "Boyajian's star" (previously known as "Tabby's star") has continued its completely perplexing pattern of dimming and brightening at irregular intervals. This year, researchers more or less ruled out the possibility that the behavior was due to an alien megastructure orbiting the star. But that doesn't make this object any less mysterious to astronomers. In May, various telescopes and observatories joined together to study the star during one of these strange bouts of dimming and brightening. If Mars was once a watery haven, what caused the planet to become a cold, lifeless rock? NASA's Maven spacecraft is continuing to study the mystery of Mars' missing atmosphere. In September, the sun belched up the largest solar flare in over a decade. The enormous eruption sent high-energy particles hurtling at the Earth, causing interruptions in some radio communications frequencies.